In this guide Daniel “Dancop” Schier shares the experience of his ASUS GeForce GTX 1080 Strix overclocking adventure. The guide primarily covers extreme overclocking, but a novice overclocker will undoubtedly pick up some tips as well. Disclaimer: this guide was originally posted on the HWBOT forum and is made available on Overclocking.guide with express permission from Daniel. Just drag and drop the XOC file on the prepared NVFLASH shortcut. This BIOS has no power target and a fixed measured voltage around 1,24V. If you try this BIOS on air, you’ll notice a very fast increase temp-wise, so be careful. I did some initial testings with the original BIOS and found that 1,24V is good enough for 2250 to 2300. I will play the card a bit more and leave some space for upcoming information. I think I don’t have to show pictures from the ‘Plastidipped’ (covered with a layer of plastic to prevent condensation problems) card. Below you find all relevant information regarding the Hotwire modification. The readouts (TOP) and Hotwire (BOTTOM) are from left to right: PLL/MEM/VGPU. Furthermore you’ll have to short the former LN2 pad, to activate Hotwire and remove the small resistors shown in the picture. Do this only if you want to use Hotwire method! Instead of Hotwire, you can also use the following VR. Note that you still have to remove the resistors and short the former LN2 pad. Below an overview of my test results on air cooling using the original BIOS. The XOC BIOS would increase the temperature of the graphics card too much, so it was not stable. First tests on cold showed no signs of coldbug or coldbootbug problems – hell yea! So, the first tests where a kind of tricky and fun as well. 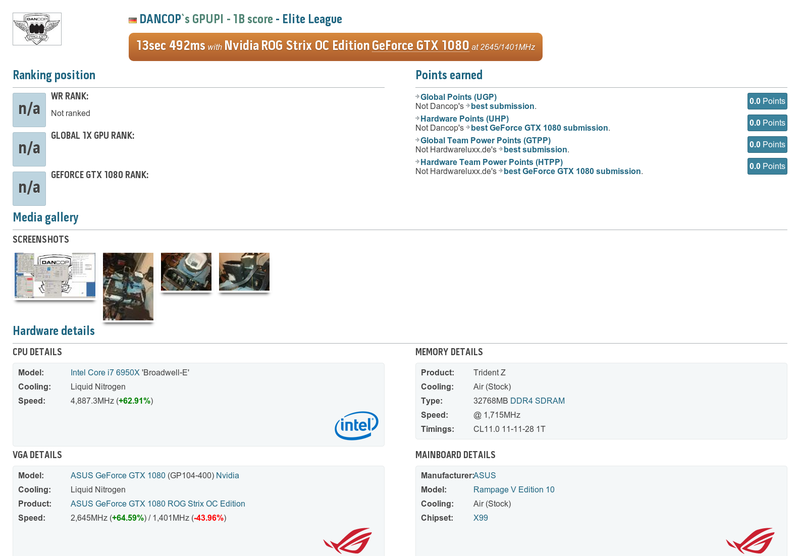 I did testing using 3DMark Fire Strike Extreme and GPUPI. Note that you shouldn’t consider GPUPI as a very intense GPU stress tests which is why the clocks where so high. For heavy 3D stuff we’re talking much lower clock frequencies. Memory frequency cold issues: not (!) the case with my card. Using ambient cooling the headroom for the graphics card is about 5750 MHz and using extreme cooling it increases to 5850 MHz. Below a simple step-by-step guide on how to get the most out of your card using liquid nitrogen. Step 1: Start with the pot at positive temps at around 10 degrees centigrade. 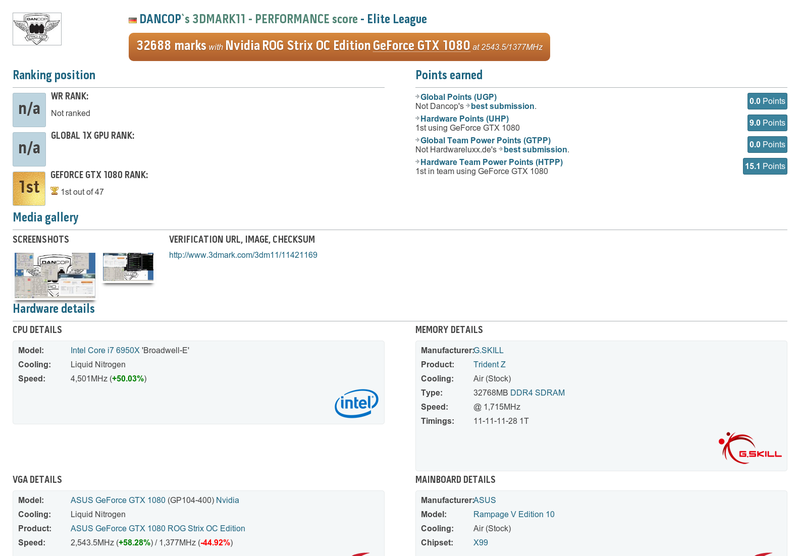 Try to figure out the maximum stable clocks in GT1 from 3DMark11, which was by far the hardest benchmark for my card. Don’t touch the voltage yet. Step 2: If you found the maximum stable clocks, reduce the temperature while leaving GPU-Z Render Test running. The goal here is to maintain load on the GPU while decreasing the temperature. Step 3: Once you hit minus 40 on the GPU, you’ll notice a drop in your frequency around 100 to 120 MHz! Here we have the first temp issue with the GPU. Think about it like this: the GPU thinks it’s running way too hot and reduces the frequency to the lowest possible boost frequency. Moving forward, add this to the offset adjustment. Step 4: Continue to decrease the temperature. At a certain temperature threshold, you will see a black screen. It is important to remember the exact temperature at which this occurs. Reboot the system. After the reboot you’ll notice positive temps in idle, even at full pot. The first picture shows the idle behavior with full pot. Full pot is so cold that even under load the GPU detects positive temperatures (sarcasm). The second picture shows the IDLE and LOAD behavior at minus 120. In IDLE the GPU is too cold to have the sensor work correctly, but in LOAD the GPU heats internally and the sensor goes back to the minus 40 which is the lowest Afterburner can detect. I’ve tried to address this problem by applying a constant load using GPU-Z Render Test, but even that workload is not high enough to heat the GPU enough so it detects the right temperature. Now we come back to the third bullet point. When the GPU sensor detects a temp higher than minus 40 degrees centigrade, the boost frequency will jump up 100 to 120 MHz. This will result in a system crash. For example, instead of 2320 MHz you will be boosted up to 2440 MHz. So, let’s recap. Everything below minus 95 degrees centigrade is not stable for overclocking. So let’s go back to minus 90 and start raising the frequencies. Step 5: Try to find the highest working voltage. I recommend to start with +200mV, which is around 1.29 to 1.31V load. Now adjust the offset to 2300 core frequency. Let 3DMark11 GT1 run and see how far you can go with the voltage. If you get an instant black screen, your voltage is too high, which also might be a temperature problem. Note: I was able to adjust higher voltage with lower temperature. Step 6: When we found our maximum voltage, we can start looking for the max core frequency. Memory frequency should be at least the same like on air cooling. Sometimes you’ll see the card running a certain frequency easily and afterwards not again after a crash. In that case reset the driver or reboot. Overclocking wise the cards a pretty consistent: I was able to bench exactly the same freq, even after 4 hours of benching. I saw no problems with adjusting clocks at any temp, like we all know it from GeForce GTX 980 Ti graphics cards. On air cooling the card is really quiet! The original BIOS is already really good and quite efficient. This is perfect for gamers and ambient overclockers! If you want to play on colder temps starting from advanced water-cooling you may want to give the XOC BIOS a try. Bear in mind the caveats! On air cooling, always keep watching your temperatures. This is the main thing to lose efficiency, as the GPU loves to clock down at some certain temperature points thanks to GPU Boost 3.0 technology. For those who will use water-cooling. Be careful when using a GPU block exclusively. Ensure contact is excellent – this may be require extra validation on your side. Also keep in mind that the VRM needs proper cooling as well. For extreme cooling, I recommend using the back-plate. This dispenses the mounting pressure the safest way! Pascal has no DVI/VGA converter anymore, so VGA won’t work. Just use any other cable, all worked full pot for me! In the article above I’ve written down my experience with the card. If you see different behavior from your card, feel free to let me know in the comments below or in the HWBOT forum thread. Note that all overclocking is on your own risk. I do not take any responsibility if you damage your hardware by practicing what I’ve shown in this article. All hardware modifications are your responisbility. Note that you void your warranty by soldering on the card. Below a list of overclocking results posted at HWBOT. Below a list of questions and answers from the HWBOT forum thread which may help you. Question: Can we use the BIOS on Founder’s Edition cards? Answer: While I’ve seen people do this – really, it’s on your own risk. I can’t recommend doing this since the VRM on the Founder’s Edition card isn’t as beefy as the one on the Strix. Be very careful! Question: Does the BIOS work on GIGABYTE G1 graphics cards? Question: Does the BIOS work on Palit JetStream graphics cards? Question: Does the BIOS work on EVGA FTX graphics cards? Question: Is there a BIOS for the GTX 1070 Strix? Answer: Not available at the moment. Hi. I have one question. I have a video card ASUS STRIX-GTX1060-6G-GAMING. Can I flash the BIOS of this video card BIOS from ASUS STRIX-GTX1060-O6G-GAMING. Or not?? Unlocking power target only means nothing. you’ll have to increase voltage at upper levels. is there a BIOS with improved performance for the KFA2 GTX 1080 HOF? or can I use the BIOS for the Strix? and is there any article like this one on the net? An interesting discussion is worth comment. I think that you should publish more on this subject, it might not be a taboo subject but typically people do not discuss such subjects. To the next! Kind regards!! uafpzbqjop,This website truly has alll of the information and facts I wanted about this subject and didn?t know who to ask. Good blog you have got here.. It’s difficult to find good quality writing like yours these days. I truly appreciate individuals like you! Take care! !